Custom shower enclosures are our specialty! Add a touch of class and elegance to your bathroom with custom glass shower doors. Replacing glass shower doors are just one of the many glass related services we can help you with. If it has to do with glass ~ we're the company to turn to in Northeast Florida and the Hilton Head Island area. Fogged windows are a common problem in Florida homes. If you're tired of the foggy look on your windows, call us! We can help with new and replacement window glass, as well as condensation between glass panes. Glass doors and coastal homes just go together! However, sometimes these do need to be repaired or replaced. Whether you're looking for a new or replacement patio doors or storm doors we can help you. Are you considering adding a pet door? We are pleased to work with a very nice product that allows the pet door to be mounted into sliding glass patio doors. From replacement mirrors, to archival glass for artwork, to replacement glass for furniture, we can handle all of your interior decorative glass needs. If your windows or mirrors look like this, we can help. Call us to restore your property to its former glory. Do you live on or near a golf course and have had an errant ball break a window? We can help with those mishaps also. Hail damage to your windows, French doors or sliding glass doors. Glass Tech can help. 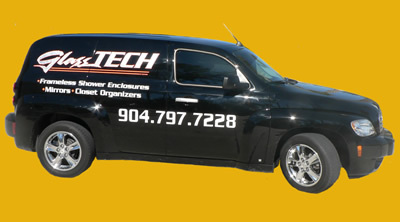 904-797-7228 for a free estimate of your job. We offer 24/7 emergency glass repair service. Call the nearest you. In business since 1993 ~ we pride ourselves on high quality service. In St. Augustine, Florida and serving St. Johns, Duval, Flagler, Clay and Putnam counties including; Jacksonville & Jacksonville Beach, Ponte Vedra, Vilano Beach, Palm Coast, Nocatee, World Golf Village, St. Augustine Beach, Crescent Beach, Marineland, Palatka, Palm Valley and Flagler Beach. for all vehicle glass inquires.